Starting out with the Farmer-to-Farmer Program in Bolivia in 1987, I have had a long history of many projects in many countries. Most of my work has been in Latin America since I am fluent in Spanish from my wonderful Peace Corps years in Guatemala 40 years ago. A few years ago I decided to branch out into other regions with my work in soil erosion, agroforestry, and organic agriculture. In 2014 I accepted my first assignments in Asia to provide assistance in Burma and Bangladesh. In Bangladesh, I worked in two small villages with a host named, “Hunger Free World,” on organic farming and farmer made input production. I was prepared for the beautiful green landscape I learned about through photos in books and magazines, but what I was not prepared for were the amazing people who befriended me in the time honored tradition of “being the guest.” I am looking forward to hopefully coming again in the near future. Small farmers around the world are eager to learn about organic farming techniques and ways they can improve soil and control diseases and insect pests using natural methods and safer inputs for the environment and human health. Profitability can improve since costs of production can be lowered. My three to four day workshops generally attracted around 30 participants including farmers, NGO staff, and a few government/university personnel. We spent the mornings in classroom discussions and the afternoons in hands-on demonstrations of fertilizer, fungicide, and insect repellent production. This is where the participants got really excited, but I made them sit through the classroom part to give the foundational principals of organic farming. Organic farming is more than input substitution of synthetic chemicals with natural products. Soil building comes first, then prevention, then inputs such as fertilizer and pest control materials. Farmers, including American farmers, seem to want to first reach for the bag or the bottle. Organic teaches a different way of thinking, where these products come last and not first. In Myanmar, I volunteered to teach organic agriculture. Part of my workshops entailed hands-on demonstrations of farmer made input production. These were well received with enthusiasm. There were usually one or two participants who were especially keen to understand these formulations. On my first trip, one farmer in particular, was at my elbow the whole time recording in notes and video everything I said. On my second trip, a year later, to do similar workshops in a different part of the country, I was asked if I wanted to go see a farmer who seemed to be doing some of the things I was talking about. We went, and to my surprise, there was that same farmer, U Myo Naing, who was managing an organic farm with 5-6 other employees and using many of the organic preparations I had taught including: fungicides, insect repellents, bio-fertilizers and Effective Microorganisms(EM) compounds. Wow, I thought, rarely does a volunteer actually see their efforts put in action, due to the short term nature of our work! 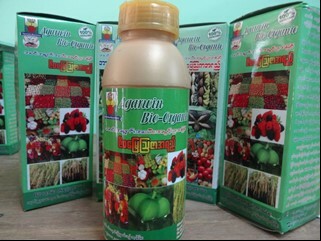 I recently returned to Myanmar for a third time, and the Winrock staff informed me that they had recently visited U Myo Naing’s small facility where he was manufacturing and selling various organic inputs on a commercial level. This rewarding view occurs rarely in a short-term volunteer’s world. These are the small things, and satisfactions which happen in varying degrees. Most pleasures in volunteering are the daily interactions we are given in working with people of different cultures, but sometimes we are rewarded with the ultimate, and that is adoption of some of our ideas! 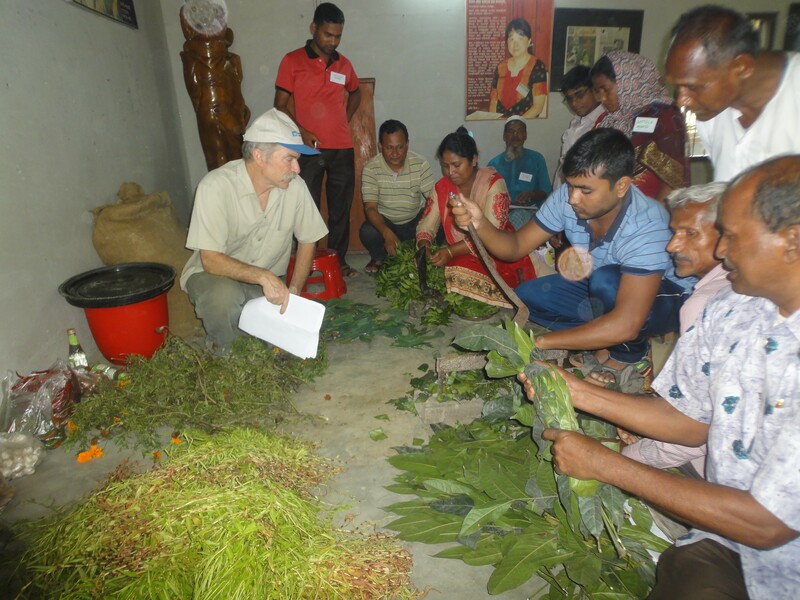 Charles Mitchell in Bangladesh giving instructions on how to prepare an insect repellent using organic ingredients and various plant leaves to spray on any kind of plant or crop to control insects. Dr. Daniel Miller shows how to measure the body weight of a cow using a measuring tape during a hands-on farm visit in Satkhira. 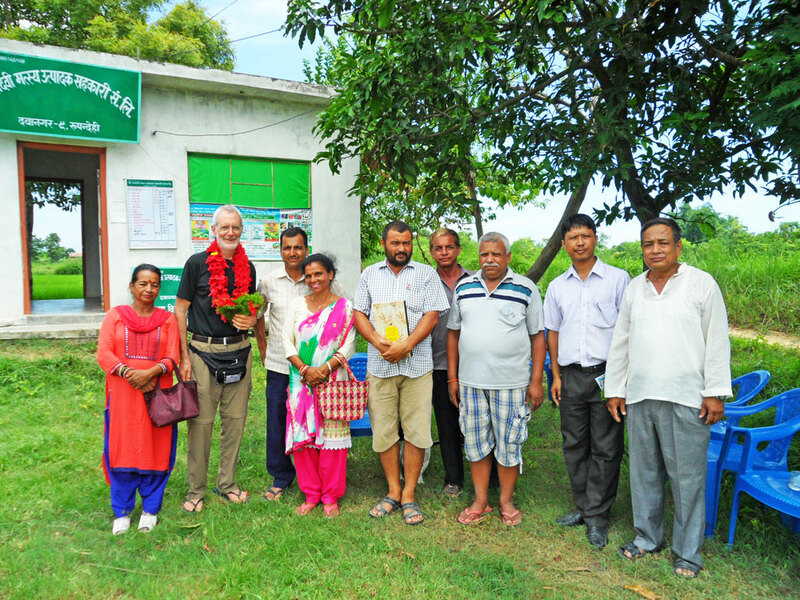 Dr. Vonny Barlow, a University of California Agriculture and Natural Resources entomology expert, conducted training sessions on proper pesticide use for the Feed the Future Agro-Inputs Project. Since the volunteer assignment, the project and the Agro-Input Retailers Network have been able to train 245 retailers and disseminate information on safe pesticide use to over 9,000 farmers. The Agro-Input Retailers Network members have rearranged shelved pesticides according to World Health Organization toxicity color codes and organized 150 farmer field days to share the information with farmers. Improved pesticide practices will subsequently help improve judicious use of pesticides and ultimately food safety and food security for the people of Bangladesh. 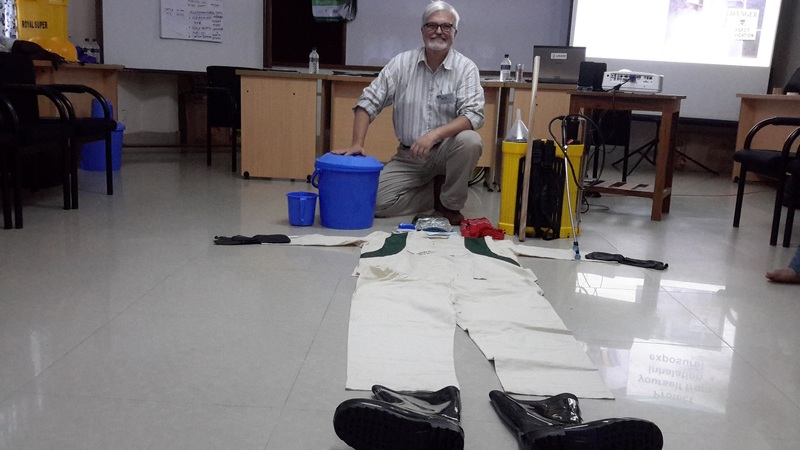 Dr. Barlow displaying the personal protective equipment that farmers are advised to use when spraying pesticides. An estimated 15% of the beneficiary farmers are now using personal protective equipment, up from about 0% reported before the assignment. 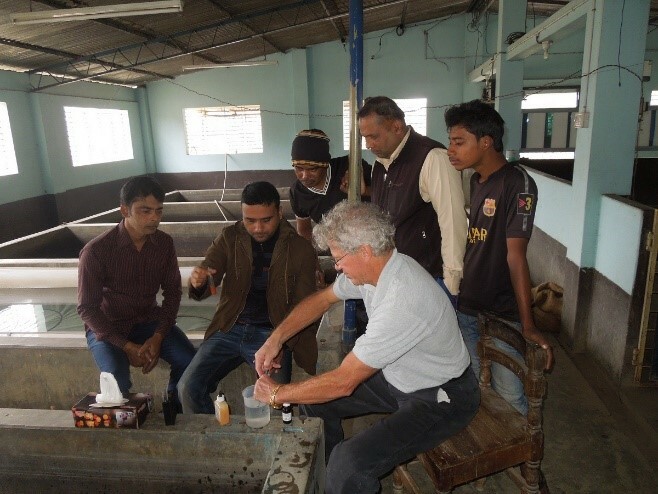 Dr. John Woiwode provided training for the Feed the Future Aquaculture for Income and Nutrition project on hatchery management and set up of a water recirculation system for fish hatchery operations. After the training, the host was able to train others on water recycling techniques for carp and tilapia hatcheries and help two other hatcheries to install water recycling systems. The systems allow for consistent supply of water to ensure production throughout the season. With one production season, the cost the equipment is able to pay for itself, and reduce energy consumption by 20%. Over 2,500 fish farmers have benefited by obtaining a consistent supply of improved quality fish spawns from those hatcheries. The host noted that Farmer-to-Farmer volunteer assistance built their confidence to help private hatchery operators to install improved water recycling systems in fish hatcheries, which contributed to low cost, good quality spawn production, and thus increased fish production. 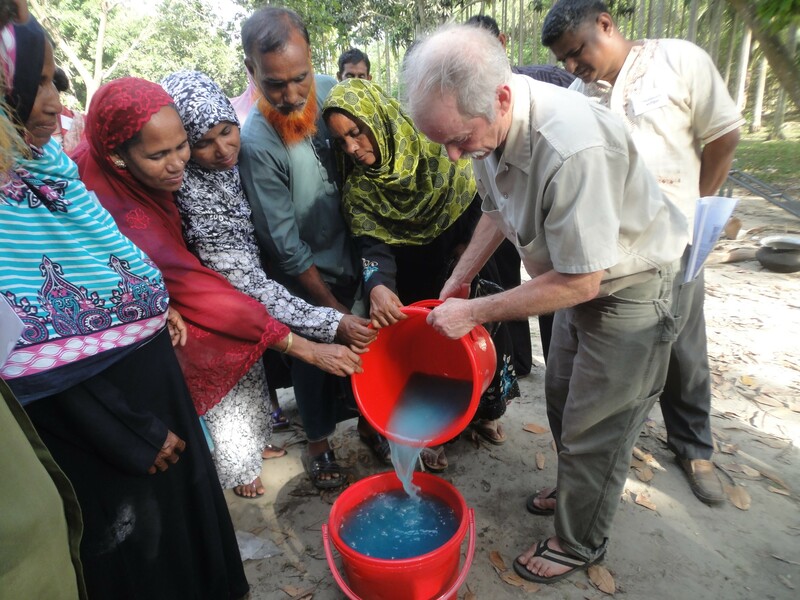 Dr. John Woiwode demonstrating ammonia measuring methods for the water recycling system at Modhumoti Hatchery in Jessore. Currently, about 27 million people live in Feed the Future’s target regions in Bangladesh where food security and nutrition present major challenges. With the continued support of generous volunteers and ongoing collaboration through the Farmer-to-Farmer program, Winrock hopes to continue to support the important mission of Feed the Future to ultimately improve the lives of Bangladeshis for years to come. To learn how you can volunteer with Winrock through the Farmer-to-Farmer program and help #EndHunger, visit winrock.org/join-us/volunteer/. I usually prefer to find a way to make assignments more active, but here at the Jal Devi Matsya Cooperative in southern Nepal we spent most of the training in a classroom, discussing the complexities of shallow earthen pond ecology, and carp production through organic fertilization and growth of natural foods. It’s a topic I know well, and which the participants were highly motivated to grasp. The level of involvement by female participants was inspiring. Women are involved in the cooperative at all levels, and they sometimes occupied half the seats in the room. A group of three were brave enough to stop our car one morning, close their umbrellas, and squeeze in with me in the back seat. In the classroom both men and women sit in relaxed positions, often cross-legged, in the plastic chairs. They self-segregate, with women on one side of the middle aisle and men on the other. The women were sometimes less vocal but at other times more willing to speak up to let me know when they understood a concept or when they remained uncertain about something. Women immediately gravitated to the microscope during class exercises, and generally became more skilled at mounting slides and getting plankton, or gut contents, gill tissues, or skin scrapings in view and in focus, and understanding what they see. On many afternoons we left the heat of the cramped classroom by 3 or 4 pm to spend an hour visiting participants’ farms. (This is southern Nepal, at 300 feet above sea level, and midday temperatures often exceeds 100 F.) All co-op members manage ponds and many own land, and I believe that puts them among the wealthiest tier of the Banghusari population. Several were able to speak English but Arun Thapa, Winrock International, Nepal Farmer-to-Farmer Project Management and Communications Specialist, knew that I would insist on translation to Nepali for continuity among the group. I expect the follow-up evaluations of this training will indicate greater impact than many other assignments I’ve conducted for Winrock. Participants demonstrated extraordinary motivation to implement improved practices. During my initial visit to Jal Devi Matsya, I observed 20 Secchi disks in their storehouse. They were dusty, and it soon became clear that their use was not well understood, and as a consequence I made a major effort to reinforce the use of Secchi disks. They are a key low-tech tool for plankton management. Reliable measurement of plankton density allows the pond manager to adjust nutrient loading with fair accuracy. Participants learned to limit manure and feed applications until plankton density, as measured with a Secchi disk, was 20 to 45 cm. This criteria is well-established throughout Asia for semi-intensive carp polyculture in fertilized earthen ponds. Managing ponds so that Secchi readings are within this range generally leads to high fish yields without creating harmful environmental conditions. After explaining and demonstrating pond management techniques the Secchi disks sold out. On several afternoons I shopped for mangoes, guavas, stubby bananas and pomegranates under the threat of rain. Mounds of fresh ginger in the market piqued my interest. I took advantage of working wifi and learned Nepal is third in world exports of ginger, and also that the US Animal and Plant Health Inspection Service lists ginger as generally admissible from any source as long as the roots are free from dirt, so I bought some to bring back as gifts. Arun found me a scrub brush. He was most helpful at every juncture. Hugh Thomforde managed commercial fish farms in the Philippines and Hawaii. He is retired from the graduate faculty of the University of Arkansas at Pine Bluff, Department of Aquaculture and Fisheries. He has completed 8 Farmer to Farmer assignments for Winrock in Africa and Asia.